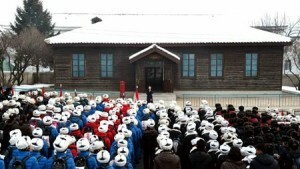 In early 2015, political pilgrimage assumed a prominent position in North Korean state media with the celebration of a “250-mile schoolchildren’s journey” undertaken to commemorate the 90th anniversary of Kim Il-sung’s crossing of the Yalu River at Phophyong in North Pyongan Province in 1925. 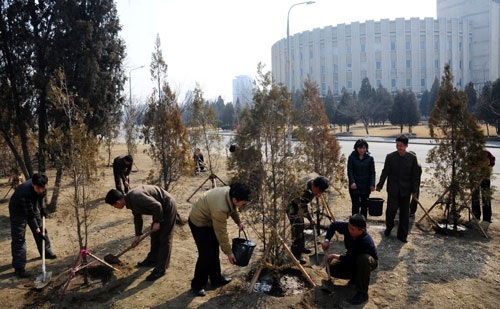 In my most recent essay, I looked at this process as a form of deterritorialization of modes of relation and interaction in North Korean historical narrative, and then considered reterritorialization via symbolic and ritualistic re-enactment. In concluding, I asserted that one of the most interesting elements of the reterritorialization was the fact that it did not conclude with re-enactment of the crossing undertaken by the person it commemorates. 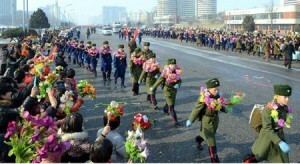 Whereas Kim Il-sung broke the bounds of Chosun colonial territory and embraced new subjectivities of resistance from which he would re-emerge years later as the founding leader of the Democratic People’s Republic of Korea, the school children ended their journey on the banks of the river, their subjectivity returned to a contemporary mode. 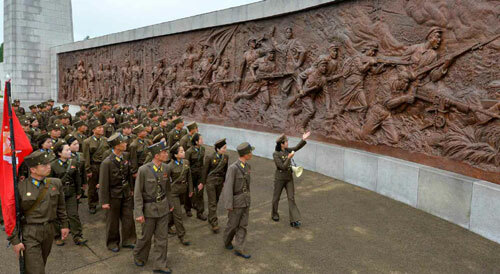 This essay explores other processes of territory, boundary and crossing in North Korean historical narrative, those undertaken by persons capable of such territorializations and reterritorialized in commemorative and political culture ever since. 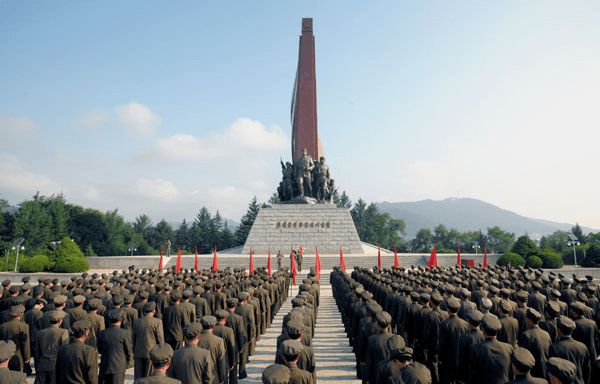 Though the main protagonist is–as ever–Kim Il-sung himself, the process of crossing is common currency in the stories of a great many figures in North Korean political history. Resistance: A Family of Border-Crossers | Early in the 1920s, Kim Il-sung’s father Kim Hyong-jik is said to have made a river crossing of sorts during the process of his resistance to Japanese colonial power. 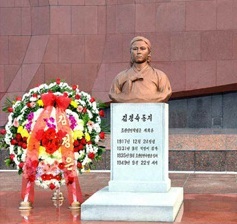 Kim Chun-san, the father of Kim Il-sung’s first wife, Kim Jong-suk, is also recounted as “having engaged in the independence movement against the Japanese for many years, crossing and recrossing the Tumen River.” Their motivations for moving across a national territorial boundary–in the words of Park Hyun-ok, the “osmosis” of Koreans as imperial subjects–may have been economically motivated, but in the retelling it is statements of resistance that loom largest. Here we are primarily concerned with the early crossings, reterritorializations, and deterritorializations of Kim Jong-suk, one of the key narrative figures from early anti-colonialist, “heroic” era North Korean politics. 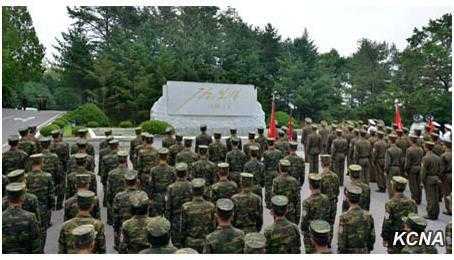 Kim is now reterritorialized in monolithic commemorative form throughout North Korea, but in particular at her grave site in the Revolutionary Martyrs Cemetery in Pyongyang. 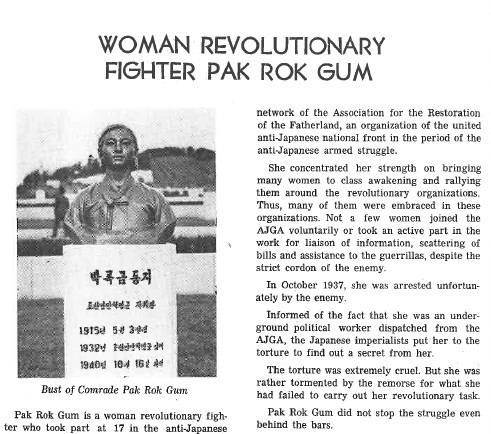 Her journey from narrative obscurity to the status of ‘anti-Japanese war hero’ has been a long one; indeed, her charismatic reterritorializations are almost as dramatic as the deterritorializations and border crossings upon which the narrative itself is built. 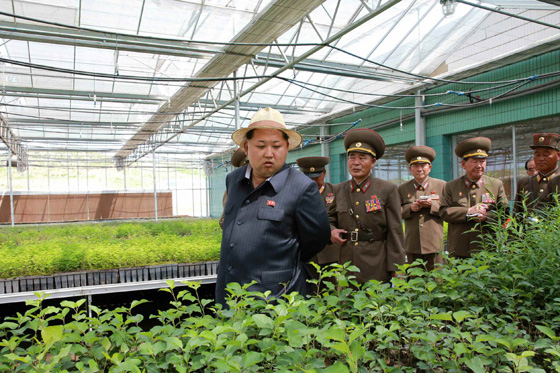 The entire story of Kim’s life has taken on the kind of epic proportions which would readily spill over the boundaries of this limited essay, so engagement with her encounters with the topographies of the guerrilla struggle and Kim Il-sung will have to wait. 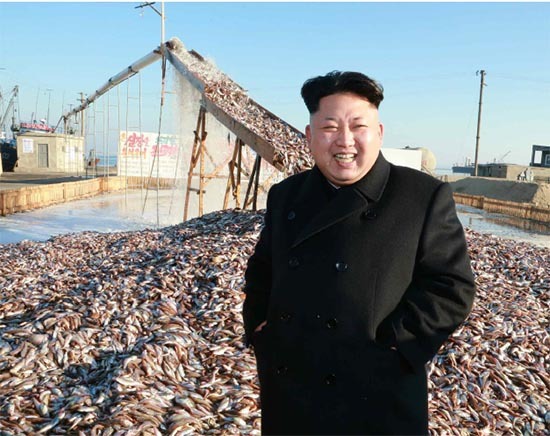 For the time being, I focus simply on the crossings, territorializings, and becomings of her childhood and early adult life, which created the personhood of political charisma through which contemporary North Korean politics seeks to reterritorialize and extract charismatic subjectivity. … the family, unable to pay back its debits, lost its share cropping land and its thatched cottage was pulled down. 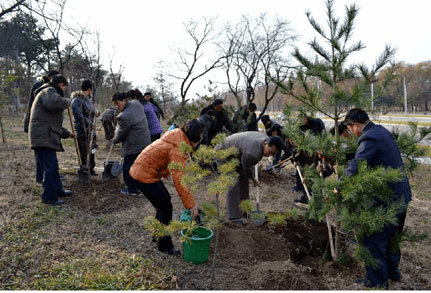 They had to live in a room in another family’s house on Osan Hill…. Aside from this terrible impact on the household economy, we are also told that Kim Chun-san died in “a foreign land” in 1929. 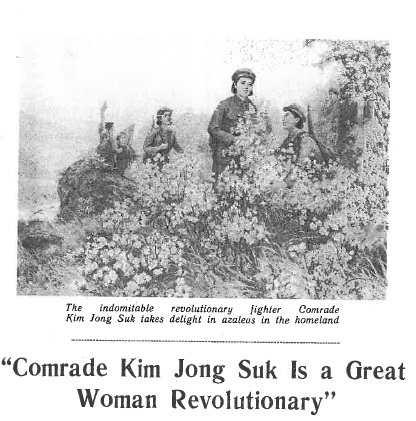 Meanwhile, Kim’s mother who had “helped her husband in his patriotic struggle” was killed “by Japanese ‘punitive’ troops in 1932.” According to the historical narrative, her suffering did not end there, as elder brother Kim Ki-jun and Kim Ki-song were both killed fighting the Japanese as part of the forces of Kim Il-sung. 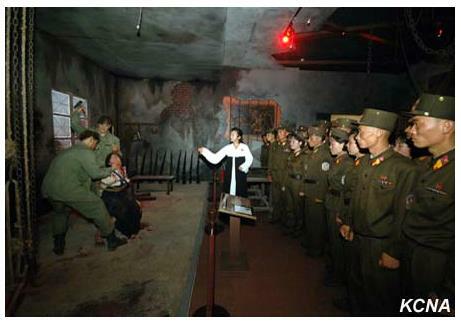 This panoply of violence and death within one revolutionary family is shared with the family of Kim Il-sung, as is their crossing, Rubicon-like, of the Tumen. 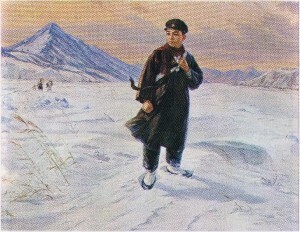 Kim Jong-suk shares her late husband’s tendency for intense retrospective remembrance, conceiving of this crossing as a vital moment in her upbringing and her development, transformative and distinct in its embedding of geographic locality within her consciousness, as demonstrated by the epilogue which begins this essay. An examination of the utility of each crossing in the narrative demonstrates its use in the development of Kim Jong-suk’s own subjectivity. 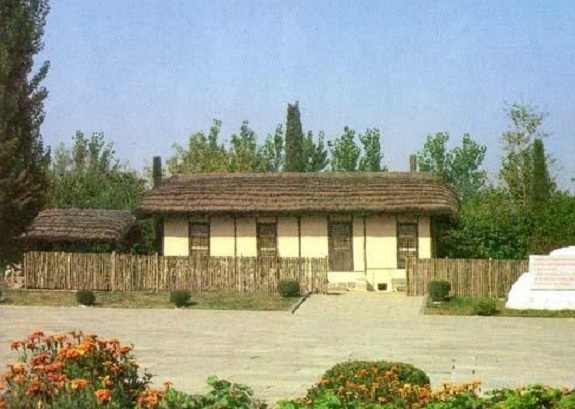 For while Kim Jong-suk and her family may have broken the bounds of their colonial subjectivity in their crossing of the Tumen and reterritorialization thereafter, they had not escaped their deeper subjectivity as peasants. 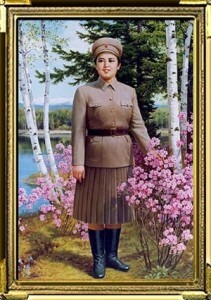 In the spring of the year when she reached the age of ten, her elder sister Kim Kwiinnyo was made the servant of a landowner because her family was unable to pay back the debts they owed to him… when the landowner and his sons came to take her…Kim Jong-suk [was] injured trying to protect their sister…. Not satisfied with this, the landowner deprived her family of the rented land… and instigated the police to watch her father and search her home frequently…. 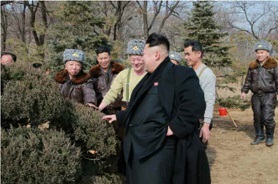 Kim’s developing sense of nation would later drive her into a multitude of crossings and re-crossings. 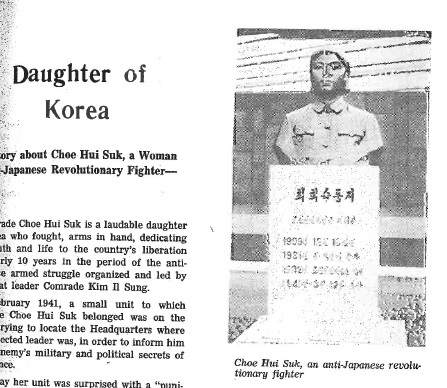 Alongside the revolutionary groups with which she was affiliated, she would live a migrant’s life of fleeting residence and journey across the boundaries of Chosun and the colonial statelet of Manchukuo. However, before her connection with the Young Communist League at the juncture of young adulthood, her final crossing, in which her subjectivity was transformed beyond the bounds of territory, is recounted as having been neither of geography nor terrain. The die was cast it seems, there would be no further reterritorialization of the young Kim Jong-suk; only escape, transience and journey through resistance and revolution. 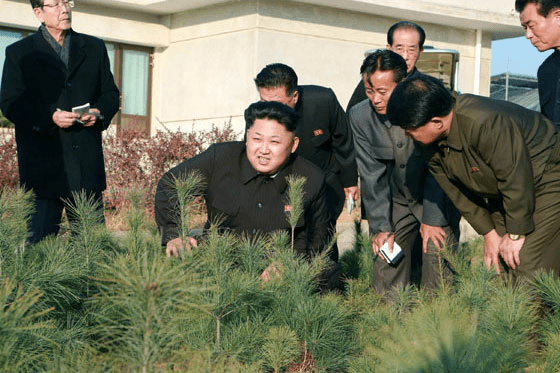 In the next essay in this series, I explore how in later years Kim Jong-suk’s subjectivity would become acute and distinct, her personhood itself would bestow charisma and energy upon the ground across which she journeyed and fought. 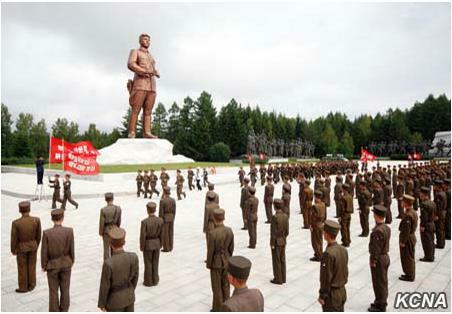 Charisma and authoritative energy derived from the crossings, traverses and travails of Kim Jong-suk and Kim Il-sung, that in later years could be re-deployed, transferred and redirected through pilgrimage, commemorative and contemplation, in the contemporary North Korean everyday. This quote, and all that follow, are taken from an electronic version of Kim Jong-suk: Biography (Pyongyang: Foreign Languages Publishing House, 2005). The book, unfortunately, is not paginated. Multiple digital copies exist, the best and virtual facsimile of the physical version is located here; this version was used in the production of this essay. Another copy, hosted in the United States, can be found here.